Mount Rainier, capped by a lenticular cloud, towers over a field of wildflowers and Edith Creek in the Paradise section of Mount Rainier National Park, Washington. The flowers on the hillside are predominently lupine, but also include some blooming Indian Paintbrush and Bear Grass. Mount Rainier, with an elevation of 14,411 feet (4,392 meters), is the tallest mountain in Washington and the highest mountain in the Cascade Range. 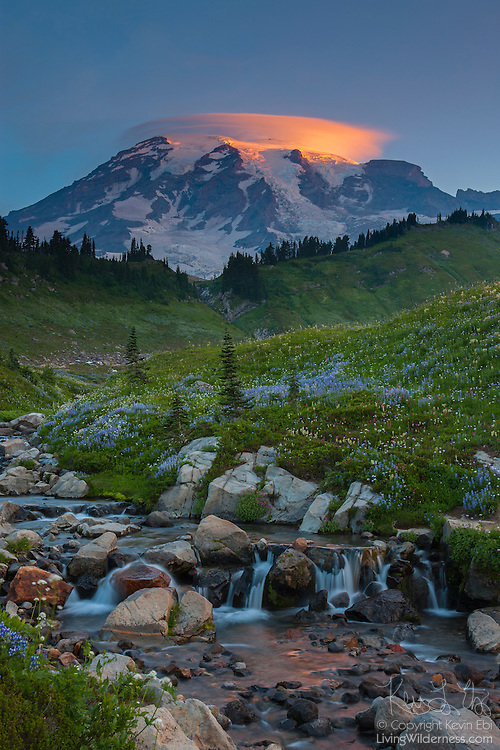 The Paradise section of Mount Rainier National Park is known for dramatic displays of summer wildflowers. Copyright 2012 Kevin Ebi/LivingWilderness.com. All rights reserved.